Leaving Bangkok meant that I would be starting my orientation week with Xplore Asia, which was an exciting prospect. This is real. I have moved to Thailand to teach. Hua Hin is south- west of Bankgok by the beach, where I soon discovered that a lot of tourist come here for holiday. First stop was to drop our bags as our hotel, Baan Ton Mai, before heading straight to the mall (I’m starting to use American language as I’m hanging out with them too much). Here, we mooched around getting our phone sorted, getting a bite to eat plus buying water. This is a strange concept to me as I never buy water from a supermarket but it’s not safe to drink the water from a tap. Feels like a novelty but I will be spending lots of money on nam (water) as it is extremely hot. For the rest of the day, we settled into our hotel, had a rules/regulations session at the school where we were based and grabbed some dinner in the local community. Our hotel is a little outside of centre Hua Hin. It’s a lovely community full of small restaurant, where little english is spoken, a 7/11 (of course), a cheap market, a bar, a massage parlour and gym. Walking around on the stony pathways with motorbikes speeding pass, you feel relaxed and this feels like it could be home; all the Thais are completely friendly. What more would you want? 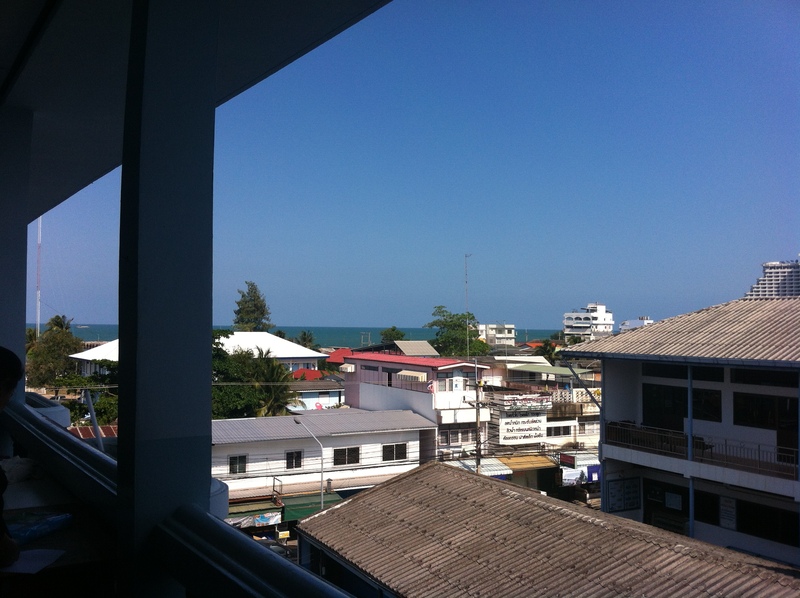 The Thai school which we are based in is along a main road in the centre on Hua Hin. On our first day here, there were no children but since they have been around. I find that generally they are shy even when I wave manically or say Sa-wad-dee-ka (Hello). However, I think they are getting use to foreigner being around so some do communicate. The school has a courtyard and canteen area as you walk in with classrooms all around. Climbing up the stairs to our class is a mission as we are based on the third floor. Definitely will be fit. Over the next few days, we attended many lessons learning about the Thai culture and language plus basic information about Thai schools in general as well as many incredible excursions. Thai language is a lot easier than I first thought. It is logical and no tenses. However, they use 5 different voice tones, whereas in English the tone doesn’t matter.